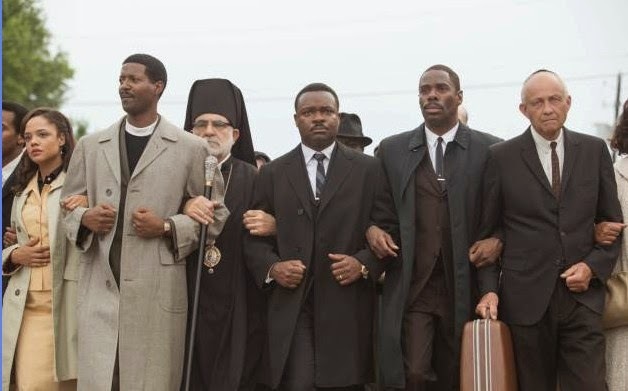 "Selma": Was omission of Heschel on purpose -- or a Hollywood blooper? 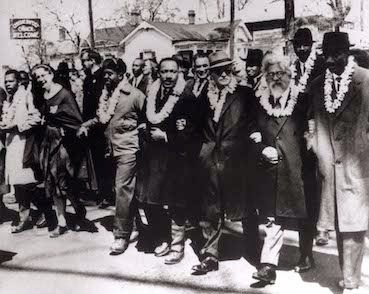 As I discussed in my previous article, Rabbi Abraham Joshua Heschel was front and center in the iconic photo of the Selma march, but was apparently replaced by a generic rabbi extra in the movie. I have puzzled over this for several days, read lots of discussion about it, and come up with a few theories about why it might have happened. Please note that these are only my personal theories, because Ava DuVernay has not, as far as I know, given any explanation other than "this is art not a documentary" and she did not want to make a "white hero movie." But that does not explain why there is no actor made up to look like Heschel in this scene. Especially since there are other white people in the lineup with King in her version. So why no Heschel? That's all it would have taken to avoid all this controversy. Just show it like it was. A still from the movie. That guy on the right is no Heschel. And what's with that suitcase he is carrying? Theory #1: Maybe DuVernay didn't know who Heschel was, and thought she could just plug in some generic rabbi to fill the slot. I'm pretty sure she had no idea how iconic his image is to Jews, or she would not have made this blooper. I mean, would she have substituted some generic priest for the Pope in a famous scene? 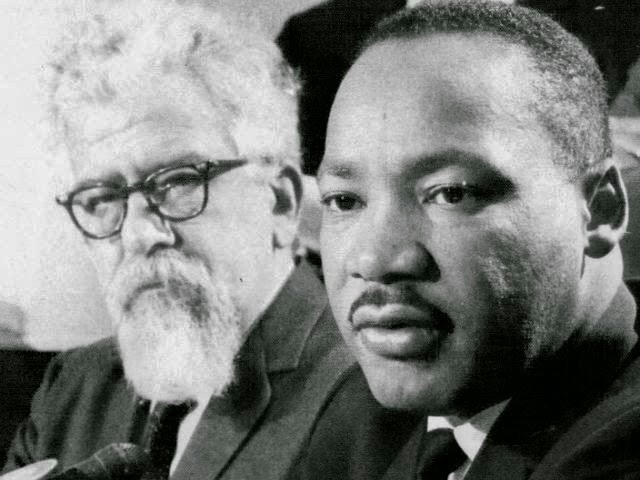 Heschel was, in his own way, equally important, as one of the foremost theologians of the 20th century. But what if DuVernay did not know that? Theory #3: If she didn't know who Heschel was, then maybe DuVernay did not recognize the Heschel figure as a rabbi, and thought he was just some old hippie. So she did a switcheroo to fit her visual imagery. After all, Heschel usually wore a beret, not a yarmulke, which is what most gentiles think of as Jewish clergy garb. But if this is the case, then her research crew really blew it. Theory #4: Maybe DuVernay thought Heschel was too disheveled and hippie-like for her 21st-century take on the scene. Again comparing the original to the still, there has been quite a bit of sprucing up. The original characters all look a bit wrinkled, as indeed they would be, after hours of getting ready for the march. Heschel himself flew out immediately after the Sabbath ended on Saturday in order to be there on Sunday -- no time for a trip to the barber. But Duvernay's actors are as natty as can be, not a wrinkle or speck of dirt in sight, not a hair out of place. And the substitute rabbi is perfectly neat and clean-shaven. Maybe that is the "art" part of it that DuVernay refers to. Creating a tableau instead of a recreation of history. But if personal appearance was why Heschel was removed, then I wonder what she would have done with a movie about Einstein? Given him a shave and a haircut? But then, she would have known who Einstein was, would have realized how instantly recognizeable his "disheveled" appearance is. 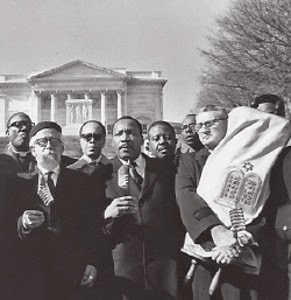 Which brings us back to my original question: Did DuVernay even know who Heschel was? Of course, I have no way of knowing what was in her head. I just have a hard time believing she would purposely edit out Heschel if she knew how close he was to King, who called him "my rabbi" and compared him to the biblical prophets. I really do think she had no idea how important Heschel was in the Jewish community, or how well-known the original photo is. This does not excuse ignorance or bad research, but maybe it does explain why she made such a terrible blooper on this famous historical scene.